Preheat oven to 400°F. Place the cake mix in a large bowl. Add 1/2 cup of the melted coconut oil. Mix until well combined. (To melt the coconut oil, place it in a small microwaveable container and heat for 20-30 seconds). Add the mint extract and additional coconut oil 1/2 tablespoon at a time, just until a dough that sticks together forms. Sprinkle the cocoa powder onto a clean surface. Roll the dough onto the surface, using the cocoa powder to keep the dough from sticking to your rolling pin. Roll to a little less than 1/2 inch thickness. Use a 2-3 inch round cookie cutter to cut the dough. Transfer to an ungreased baking sheet. Bake in preheated oven for 6-8 minutes, or just until the cookies are set. Remove and cool completely. Microwave the chocolatey candy melt in your microwave, according to package directions. 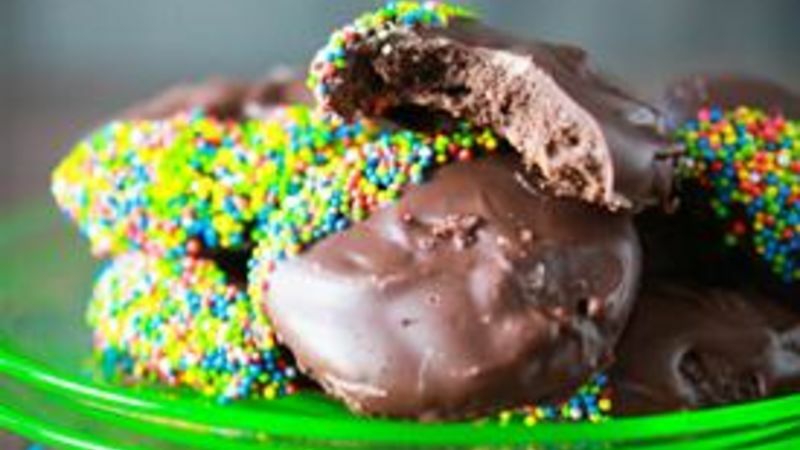 Dip each cookie into the melted candy coating, then dip the edge into sprinkles, if desired. Transfer to a piece of parchment or plastic wrap until the candy coating has hardened. Serve and enjoy! Uh-oh. Did you polish off all of the cookies in that famous little green box already? Feed your craving with this clever version you can make yourself! There's nothing quite as nice as that time of the year when those little boxes of cookies are sold in front of stores and from door-to-door by adorable little fundraising neighbor girls. But when those boxes of goodies run out, you don't have to wait the whole year before tasting the chocolate-covered goodness of a minty cookie. Here's how to make your own Mint Thins right in your own kitchen! Grab a box of Betty Crocker Chocolate Fudge Cake mix. Add a half-cup of melted coconut oil to the mix and stir until well mixed. Add an additional tablespoon or two to the mix until the dough begins to stick together. Press the dough onto a clean surface that's been sprinkled with cocoa powder. Roll that dough out until it's about 1/4" to 1/2" flat. Cut into 2-3" inch rounds. Transfer your cookies to an ungreased baking sheet. Bake until set, about 6-8 minutes. Allow your cookies to cool completely before prepping your candy melt for dipping. Dip the top half of your cookie into the prepared candy melt. Make sure the entire top of the cookie is covered. Dip the corner of the cookie into sprinkles, if desired. Place your cookies on a piece of parchment or plastic wrap and allow to cool completely. Once cooled, serve your cookies. To share or not to share, that is the question! Try more fun cookie recipes!